Yesterday, I was baptized by ice. Yes, I performed this “remembering my baptism” ritual myself. As the frigid waters ran down my head, face and back, I tried to focus my attention on the hope that my actions would somehow point to a greater cause. But I couldn’t help it. I still focused on how cold the water was as it ran down my body. When I first saw this fundraiser and awareness, I thought it was a bit gimmicky. Dumping a bunch of water on our heads: who does this help? Are we talking enough about the disease as we film these videos? Or are people just dumping water on their heads without giving a care to this horrible illness? And then my little sister nominated me. I couldn’t escape the ritual. 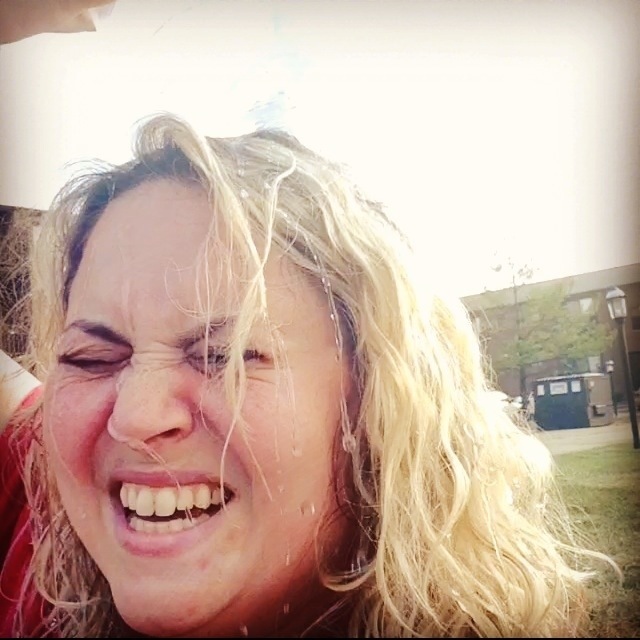 As I continually watched videos of friends and strangers taking part in the ALS Ice Bucket Challenge, I realized that icy water and a cause are drawing all sorts of people together. We are no longer individuals but connected by this ritual of pouring a bucket of ice and water over our heads in the name of stopping an illness. From Robert Downey, Jr. to Oprah to Tom Cruise, from the child heading into kindergarten to the retiree in their 70’s, and from the famous actor to the local church pastor, we join together to take part in a common ritual and cause. This ritual became more than a gimmick. It became more than a dare and more than a simple yet widespread fundraiser. For me, it was a chance to remember my baptism. As water is poured on our heads or as our whole bodies are immersed in a pool, we experience that same type of connection to others in our faith. That is baptism. As humans and as Christians, we are not alone in this messy life. In the ritual of baptism, we are reminded of grace in community. As we watch a small child or teen or adult experiencing the trickling water across their foreheads, we remember whose child we are. Our messiness as humans continues well after our baptisms but the water will always remind us that God’s grace is present with us as we abide with God and community. So as we watch our next friend or favorite sports team dump a bucket of icy water as they stand in the warm summer sun, let us remember our connection to the greater Church, our connection to those who struggle each day with the degenerative illness of ALS, and our greater connection to all of humanity. And let us remember our baptism.